Legal news for New York employment attorneys. Antorino Sewer & Drain faces fines of $11,700 after an OSHA inspection into a December 2009 workplace accident. NY contracting company cited for serious violations of workplace safety. Westbury, NY (www.NewYorkInjuryNews.com) – An Islandia, NY contractor, Antorino Sewer & Drain, officially received citations from the U.S. Department of Labor’s Occupational Safety and Health Administration, (OSHA) www.osha.gov, for seven alleged serious violations of workplace safety. The inspection followed a December 8, 2009 incident in which an employee was trapped in a 16-foot hole while installing a cesspool at an East Hills, NY, residential worksite. Antorino Sewer & Drain faces $11,700 in proposed fines. The investigation found the excavation in question lacked cave-in protection, did not have a safe means of exit from the site, such as a ladder, had taken out material stored at its edge and never had any inspection performed by a competent person with knowledge and authority to identify and correct hazards. 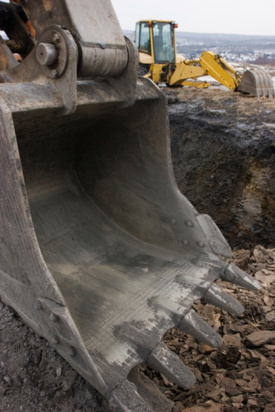 Furthermore, the employee who suffered the cesspool entrapment did not have a protective helmet and had only assessed the excavation by riding in the bucket of a backhoe. OSHA issues serious citations when serious injury and death is a likely result from workplace hazards that the employer knew or should have known about. OSHA’s Long Island area director, Anthony Ciuffo, stated in the press release, “Although no worker was seriously injured in this particular instance, the possibility of death or severe injury was real and present…An unprotected excavation can become a grave in seconds and nearly did so here.” He went on to explain the significance of sloping within a workplace such as the one inspected. OSHA standards require that all excavations five feet or deeper should be sloped, shored or otherwise protected against collapse. Antorino Sewer and Drain has 15 business days from the date of receiving citations to comply, meet with the OSHA area director or contest the penalties. Legal News Reporter: Tara Monks – Legal news for New York employment lawyers.